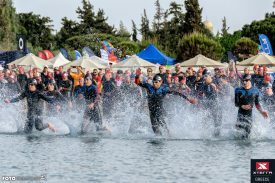 Arthur Forissier from France and Nicole Walters of Great Britain captured the sixth annual XTERRA Greece elite titles on a beautiful day in Athens on Sunday, April 29, 2018. Arthur Forissier from France and Nicole Walters of Great Britain captured the sixth annual XTERRA Greece elite titles on a beautiful day in Athens on Sunday, April 29, 2018. It’s the third career XTERRA World Tour win for Forissier, and the first for Walters. After five years under the direction of Konstantinos Koumargialis, who is now serving as the marketing director for XTERRA Europe, XTERRA Greece entered a new era with Constantinos Mitropapas and his company Trimore now in charge. The event is in the same place and on the same course as last year and for their first edition, this new team did a fantastic job. Vouliagmeni Bay is the perfect place for a triathlon with a calm sea, sandy beach, sun, and a big grassy area for the race village and finish line. As we are in the suburbs of Athens, which is a famous place to spend time at during the weekend, you can imagine it was quite crowded. While stressful for the organizers, it was a great opportunity to showcase our sport and the brand to many people. Today’s race was the third in as many weeks in the Mediterranean, and Roger Serrano and Brigitta Poor won both of the first two in Malta and Cyprus. Even though we like them a lot, it was nice to see some surprises during the race and new faces on the top step of the podium. Walters put nearly two minutes on Ine Couckuyt from Belgium and the reigning XTERRA European Champion, Brigitta Poor from Hungary. Carina Walse was 2’20” back in 4th, Sandra Mairhofer was 20″ back of Carina in 5th, and four-time XTERRA Greece champ Helena Karaskova lost 3’20”. The bike here in Greece is two 15km loops. It can be tricky and slippery on the gravel roads, but it’s a very fast course where power is more important than technical skills. That was not to displease Walters, who comes from road triathlon, and was a silver medalist in the Rio Paralympics as a guide for Melissa Reid. After the first loop, Walters was still leading, and for me, even though I knew this race would suit her well, I was expecting to see Brigitta Poor in the front at this point. “I had nothing in my legs today,” said Poor, who used lots of energy to beat Barbara Riveros in Cyprus last week. Her bike time was 20-seconds better than Walters but not fast enough to get back into the mix. The fastest bike split of the day went to Helena Karaskova, who came on strong after the swim to fight for a podium spot. Walters started the run course with about one-minute lead on Poor, and thought it would be close, but what she didn’t know is Poor was tired, and lost another 30-seconds in the first 1.5km of the run. At this point Poor was simply doing her best to finish the day and secure some good points to keep her lead in the Tour standings. Ultimately, it was finally Walters day. “Even at the end on the last meter of the run I had a hard time believing I could take the tape, and get the win,” said Walters, who moved into the second spot in the tour standings with the win, just 23 points behind Poor. Karaskova moves up to 5th in the standings after her runner-up showing today. The fastest run split went to Wasle, who was third. It’s been a very strong first part of the season for Wasle with two big wins at XTERRA South Africa and Danao, and two podium finishes on the XTERRA Euro Tour that have her sitting in 4th position in the standings. Morgane Riou 5th despite some back pain that she managed, also got some points and is now in 6th place on the tour, but still waiting for a perfect day. Maud Golsteyn took 6th position today and is 7th in the tour. Sandra Mairhofer did well with a 7th place result in her first race as an elite. Couckuyt was 8th in the race and is 8th in the tour, 9th was Elisabeth Gruber (not the same American elite named Liz Gruber) who also start racing elite with us today. Cecilia Jessen didn’t race at the level she wanted, but her 10th position put her in 3rd on the Euro tour after three races, and Jessie Roberts placed 11th today. In the men’s chase the top three finishers were all doing their first race of the season. It seems you needed to be fresh to win in Greece today. It started as usual with Serrano and Maxim Chané in the lead, but this time the chase group was not far away and with some very strong bikers. Serrano and Chane started the bike together like last week, with 1’40″on Forissier, Marcello Ugazio, Serrieres and François Carloni. At this point some favorites like Kris Coddens was 3′ back and Xavier Dafflon 5’20” back and you might think it would be over for those two, but they are strong bikers and runners that have won races starting the bike way bike like this. After one loop Serrano and Chane were still leading but only by a few seconds on the chase pack, who had dropped Serrieres. In this pack Ugazio was pushing hard, attacking all the time. “I’m not as good as the others on the technical parts so I wanted to gain some time on the easiest parts,” he said. Carloni, well known for his mountain bike quality, was amazed to see how good these young were riding. “I was all out to keep up with them, they were so fast and powerful,” exclaimed Carloni. Lucky for him, he has lots of skill and was able to play his role on the group. Starting the second loop, seeing these guys coming back, Serrano attacked. “I did the first loop saving some energy with Chane, waiting for the second loop to attack,” said Serrano. The new situation on the second loop was Serrano pushing ahead, a chase pack of four with Ugazio, Forissier, Carloni and now Chané. Serrieres was in 6th, Coddens 7th and Dafflon in 8th pushing hard and on his way for the fastest bike split of the day. Entering the bike-to-run transition Serrano was first but not with the lead he wanted. As the leader he had to make is way thru some crowds, sometime this is the problem to lead and be in a famous place. Carloni was surprised to see him that close exiting transition. “Even though I was upset about having to work my way through the crow, in the end I don’t think I would have been on the podium today. Those guys were fresh, and I was not 100% today,” said Serrano. The chase pack entered T2 together with about 15″ to Serrano. Forissier had the best transition, and we can say that with Ugazio only nine seconds behind him that Forissier won today because of his great transitions. He was 30-seconds faster combining the two transitions. Of course, it’s not that simple, but for sure it counts. Many things happened during the run to shape the results. Serrano was not able to keep the podium as Serrieres, managing his race like he said, put the fastest run split and took 3rd place. Serrano was 4th and consolidated his lead on the Euro tour. Carloni had a good run just like he did in Malta to finish in 5th and is now 4th in the tour standings. The first three finishers just started their season today, so are respectively 7, 10 and 12 in the point series. Coddens finished 6th, with this strong field and early in the season, it’s not that bad, even for sure an athlete like him start to win or be on the podium. Same scenario for Dafflon who crossed the line 7th, our best biker, who was still in the hospital just two weeks ago. Even he didn’t know, after Italy last year, that he can win a race. It’s still early in the season with 14 races to go and he will come stronger soon. Young German Peter Lehmann was 8th on the day and is 8th in the tour. Austrian Dominik Wychera was 9th and 10th wen to the local hero, Greek Gregoris Souvatzoglou. Chane had no more energy today and finished 14th Elite, but those points were enough to put him in second position in the Euro tour, passing Victor Del corral who will not follow the points series. Doug Hall dropped down to 5th in the tour today. I think all his energy went to his wife Nicole for the win. Clement Briere, who did each of the first three races, is in 6th position on the tour after his 12th place finish today. We will now have a three week break on the XTERRA Euro Tour until we head to XTERRA Lake Garda in Italy on May 27. On the XTERRA America Tour the lone race of the weekend was XTERRA Fort Yargo in Winder, Georgia. This year’s race was a close match-up between the young gun Kevin Jett and the indomitable Marcus Barton. Jett – who last year won his 25-29 age group at XTERRA Auburn, XTERRA Whitewater, XTERRA Gator Terra, XTERRA Fort Yargo, and XTERRA Myrtle Beach – was the day’s victor, but Barton, 48, was less than a minute behind him.